Are you sick of overused Internet memes? Tired of cats with poor spelling, angry faces, and cartoons saying "firin' ma laser?" No? Then you probably won't find this funny. But you guys on reddit and 4chan will think this is hilarious, because clearly the writers of the MAD cartoon show are lurkers there. 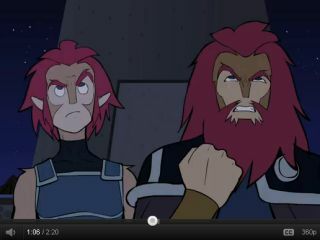 Okay, you Thundercats fans will probably get a kick out of it, too. If you're new to the whole meme nonsense, Know Your Meme can get you up to speed. Start with Nyan Cat.